Cruentis Hails from Quesnel, BC Canada where they deliver up a heavy dose of Melodic Death Metal. Cruentis was formed by Guitarist/Vocalist Tyler DeMerchant and Bassist/Vocalist Jesse Dean. Guitarist-Matt Sargent & Drummer-Daniel Willsmore were added later in order to complete the band. 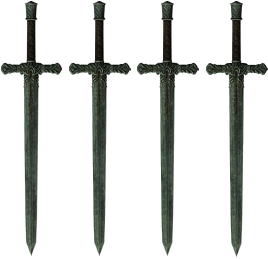 Cruentis draws inspiration from bands across the metal spectrum, such as Dimmu Borgir, Kalmah, Amon Amarth, Opeth and many more. Here at Christian Molten Metal we don't Normaly engage in reviews of Death Metal bands mostly due to their extreme Metal Vocal styles. However, when a Death Metal band is found to have vocals of a cleaner more comprehendable nature then we are sure to share. 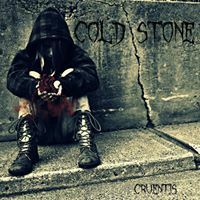 In 2016 Cruentis released their full-length independent debut album titled 'Cold Stone'. This release finds the band mixing in enough clean vocals allowing them to appeal to a larger audience not unlike what we have seen in bands like Ecthirion & Hilastherion. Cold Stone is comprised of 7 hard hitting tracks however the album escapes being labeled as an EP due to the length of their tunes. There are 3 tracks that are well over the 7 min range and one track that is over 9 min long with the album clocking in at close to 47 min in length. For an independent release, the production is solid and well thought out. The cover art is a metaphor with the homeless girl representing our spiritual state before coming to Christ. We held out our hearts pleading for Jesus to change it and dwell in it. The Vocals are handled by both ​Tyler DeMerchant & Jesse Dean where we find a wide range of delivery styles with everything from clean to melancholy to Death and even some alternative styles. Yes, there' are noticeable Vocal variances from track to track without any tune seeming strangely out of place. Both Tyler and Jesse do growls and screams, both lead and backup, varying from song to song, and sometimes switching roles even in one single song. Tyler handles the clean vocals, both lead and backup. The Guitar work of both Tyler DeMerchant & Matt Sargent are nothing short of spot on proper shredn that hits like a run away freight train haulin explosives. The guitars range from ambient to hard driving to Doom to acoustic with plenty of over-the-top solos mixed throughout. Drummer Daniel Willsmore is the mad man behind the kit laying down some ambient speed drum lines which are in keeping with the genre. Willsmore does a good job at mixing in various time changes and propeling each tune forward with plenty of energy. Jesse Dean handles Bass for the band adding a thicker heavier sound with his thundrous touches. When it comes to the band's uncompromising lyrics the band states the following in the interview at The Metal Resource: "Part of the reason we wanted to start this band was that there is a distinct lack of Christian Melodeath bands of the type that we like. There are many good bands, but to find this kind of sound with uncompromising lyrics is hard. We wanted to bring something solid to the Christian metal scene with authentic Christian values." Mathew 7:13 "Enter through the narrow gate. For wide is the gate and broad is the road that leads to destruction, and many enter through it."